Jigs@w Puzzle Promo Creator is a wizard which will help you simply and quickly create your own custom jigsaw puzzles. These small jigsaw puzzle games can contain your logo, banner, picture, corporate colors and a link to your web site, all in one short executable file. All texts are localizable or changeable. Promote your web site, services or products with your jigsaw puzzles. Powerful and absolutely free! 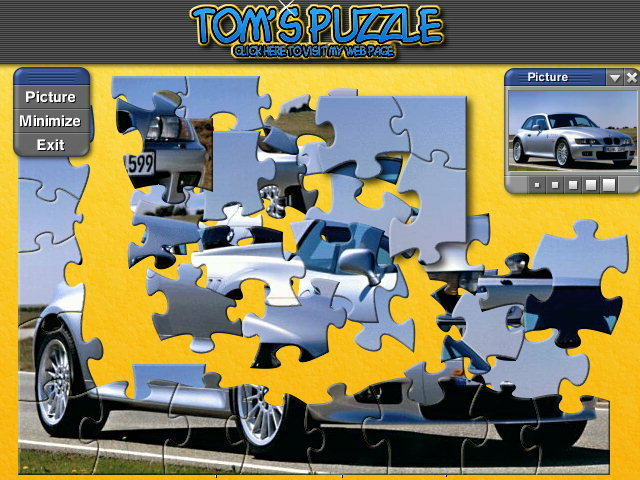 Promote your web site, services or products with a custom jigsaw puzzle. ...... It is of course possible to make a link from the banner to your web site. It is also possible to use the animated banner and get a considerable amount of space for your presentation. Regarding the fact that Jigs@w Puzzle Promo is very small, it is possible to exhibit it on your web site, distribute it via e-mail, on disk or CD-ROM. Jigs@w Puzzle Promo Creator is a freeware. Create realistic jigsaw puzzle games with any pictures easily! Is a proffesional jigsaw puzzle game. Jigtopia jigsaw puzzle game is guaranteed to give you hours of fun. This is a great jigsaw puzzle of the Full Moon. Qweas is providing links to Jigs@w Puzzle Promo Creator 2.10 as a courtesy, and makes no representations regarding Jigs@w Puzzle Promo Creator or any other applications or any information related thereto. Any questions, complaints or claims regarding this application Jigs@w Puzzle Promo Creator 2.10 must be directed to the appropriate software vendor. You may click the publisher link of Jigs@w Puzzle Promo Creator on the top of this page to get more details about the vendor.